Sony Ericsson K850 for AT&T canceled? There are rumors that the 5-megapixel K850, previously reported to be offered with the number 1 U.S. carrier might not be seen at all. 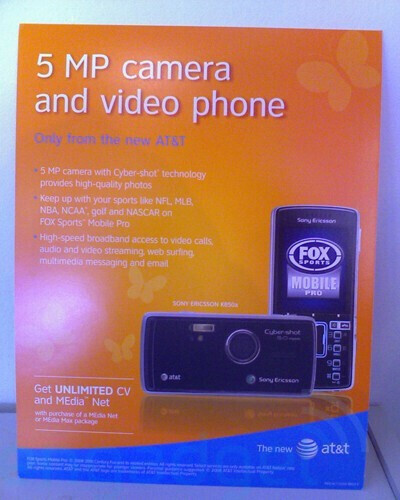 The ad posters depicting the K850, seen at AT&T retail locations, have been ordered “down and in the trash can” by AT&T corporate officials. This suggests that the first SE 5-megapixel cameraphone is not only not on schedule, but may not be coming at all. Nevertheless, we hope that the rumors are not true and the device will surface out of the darkness soon. There definitely will be no launch of the K850. I overheard a Sony Ericcson representative in an AT&T store telling the employees that they were not foing to be launching the K850, but in 2 weeks will be releasing the Z750 in three colors. Ahaha, in Canada Rogers is already selling this phone and they are getting the Z750 too or Fido is getting it.